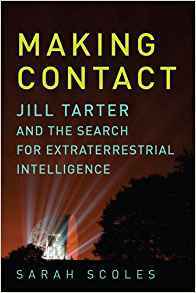 Sarah Scoles is the author of the new book Making Contact: Jill Tarter and the Search for Extraterrestrial Intelligence. 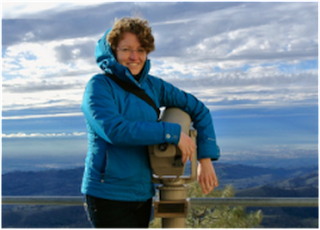 She is a science writer, and her work has appeared in a variety of publications, including Wired, The Atlantic, Smithsonian, and The Washington Post. She lives in Denver, Colorado. Q: Why did you decide to write this book about astronomer Jill Tarter? A: If I’m being totally honest, I set out to write a novel, and found I wasn’t great with plot, so I decided to think about a nonfiction topic I could bring storytelling to, without having to come up with the events myself. 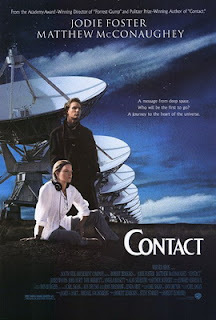 I had watched [the movie] Contact when I was a young teenager, and was fascinated by the topic. I worked at a telescope in West Virginia and in Puerto Rico, and was mulling it over, doing research on SETI and Jill. She was the basis for the main character in Contact. She had done a lot of interviews, but the books written about the search for extraterrestrial intelligence were 20 years old, and no one had told the full story of Jill’s life. Q: So what happened when you approached her? A: It took her a few months to return my email. She asked me to send an outline. We met in person at a conference, and I laid out a vision for the whole thing. I convinced her I was capable of writing a whole book! She said, People are trying to get me to write my autobiography [but she didn’t want to]. It was fortunate timing! A: I gathered books that people had already written in the ‘80s, ‘90s, and early 2000s to get an idea of the science during that period, and I dug into references in the back of those books. I tried to figure out where the scientific and political aspects fit into her life. I did tons of reading. I have a huge Scrivener file that helped me organize everything. She was extremely generous with her time. I moved to California when I was working on the book. She was in Berkeley. She had created a lit of the top 100 moments in her life, and that was really helpful to me. I went through papers in her office, and family photo albums. Q: What surprised you in the course of your research? A: I guess what surprised me and probably shouldn’t have was how many times scientists, and Jill herself, were knocked down and had to get up again—with funding, or academic obstacles. Jill began her work when it wasn’t common to have women in her field. I was surprised someone would keep going [when] it seemed a lot of people didn’t want them to. Q: As a woman in her field, what were some of the obstacles she faced? A: It started pretty early for her, in high school when counselors would push her away from taking science classes. In college, everything was very segregated. The boys would work together, and she would have to do it on her own. Being in classes as the only woman was not a fun thing. After she had her credentials, things were more subtle. The difficulties were having your voice heard in a room full of men. In the book, one colleague says she can be gruff. He imagines it came out of having to have her voice heard. Q: Has she seen the book, and if so, what does she think of it? A: Yes, she helped me with fact-checking. She liked it. She said for most of the time, she doesn’t know why anyone would be interested in her life. I was invested in thinking that was not true! When we started the project, she wanted me to show the bad and the good parts of her and her history. She is glad to have her story out there now. Q: What do you see coming next for her and for her field? A: For her, she retired from the SETI Institute but is still on the board. The SETI Institute is building and upgrading a telescope. She’s very focused on making sure it progresses…she’s dedicated to searching for extraterrestrial life. Aside from that, her goals are more philosophical. As optimistic as the field may have started out, if we find alien life, it could be a long time. [Experts have] to convince people the search is worthwhile while we’re waiting. If the idea of being alone in the universe can unite [people], she gives a lot of public talks, on how SETI can make people see how small a part of the universe we are. She’s working on helping people figure out if we should be sending messages to outer space instead of just receiving them. The field has just gotten money for Breakthrough Listen—to search for messages from smart aliens. That’s exciting. Also there’s another field, astrobiology, focused on aliens that might not be smart, just microbes. Telescopes are getting to the point where you can tell if they exist. That’s also an exciting and new development. A: I’m not. I’m getting to the point where I’m starting to think about whether I would do that again. It’s like running a marathon, [afterwards you say] I’m definitely not going to do that again, and a couple of months later, you say, maybe I could do it again! I’m a freelance science writer, and most days I’m writing articles about the culture of astronomy and physics. A: The only thing is I read a lot of biographies before I started writing, looking at how they structured people’s lives. When you’re writing about a very famous person, you can write in chronological order and people are interested. Jill is famous to a subset, but is not a household name. So I tried to make it a storyline that would stand on its own.